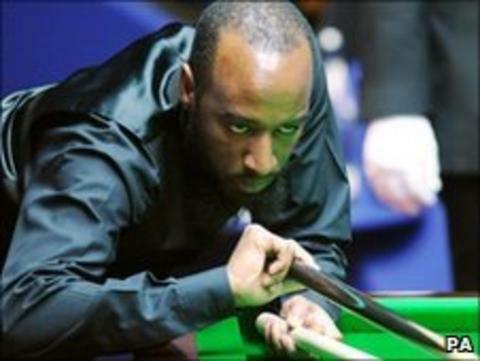 World number 16 Ricky Walden criticised Rory McLeod's playing style after their first-round World Championship match, which McLeod won 10-6. "It was like a dentist's appointment, absolutely painful from start to finish," Walden said of a game which lasted seven hours and 16 minutes. "Rory's a great guy, and the way he plays the game is fair enough. "But if everyone played like that we wouldn't have a game. People can't wait to get out. The game would be dead." The pair were level at 4-4 overnight as the slow nature of play meant the day ended with only eight of the nine scheduled frames having been completed. After the opening two were shared, world number 36 McLeod won four in a row and finally sealed victory. He was quick to reject Walden's criticisms, however, and said: "He played a lot slower than me on both days. I know him as a fast player. I was trying to get on with it. "He controlled the pace a bit more than I did. Look at the video again - take a look at the shot times and you can see who was taking a long time and who wasn't." Unfortunately for McLeod, those times showed that he spent an average of 33 seconds over each shot, while Walden took 29. Walden added: "It was a horrible game, I didn't enjoy one minute of it." World Snooker chief Barry Hearn is keen to improve snooker's reputation as a spectator sport and has hinted that officials could urge players to quicken the pace when the play becomes turgid. Referee Jan Verhaas chose not to intervene in this instance and McLeod commented: "He would have had to say something to Ricky first. He didn't say anything to either of us. Sometimes you can't play the shot fast." McLeod, who spent 10 years on the Challenge Tour, appeared tense in the closing stages of his most impressive victory to date. The 40-year-old could have left Walden needing snookers had he played for the black after potting the final red but instead opted for the blue, resulting in a tense safety tussle, with McLeod missing three attempts at the yellow that would have been decisive. In a frame lasting almost an hour, with only two colours on the table and needing a snooker, Walden inadvertently sank the pink to send McLeod through to face John Higgins or Stephen Lee, whose match was delayed slightly as a consequence of the attritional encounter. Triple world champion Higgins lost in the second round to Steve Davis last year and then became embroiled in a scandal which led to him being suspended for six months for breaching rules around betting. The Scot, 35, received a warm welcome on his return to the Crucible and duly knocked in three century breaks in five frames after the mid-session interval to take a 6-3 lead over Lee into Thursday's final session. Englishman Mark King struck the highest break of the tournament so far - a superb 138 - but it was not enough to prevent him losing 10-7 to Scotland's Graeme Dott. Dott, last year's runner-up, began the afternoon session 6-3 ahead and stretched this by a further frame before King's high break - his best at the Crucible - kickstarted a revival that saw him win three successive frames. However, 2006 champion Dott pulled away once more to seal victory and secure a second-round match against Ali Carter. Martin Gould beat Marco Fu 10-8 to set up a second-round match with Neil Robertson's conqueror Judd Trump. The 29-year-old, who beat Fu 10-9 at the same stage of the event last year, resumed 6-3 behind but won five frames in a row against an out-of-sorts Fu. World number 21 Fu seemed as though he had regained his composure with a break of 60 after Gould had knocked the black off the table, and then added an effort of 100 in the next to level the match at 8-8. But Fu played some curious shots, conceding 15 points with three fouls in quick succession, failing to hit a red barely two inches in front of the cue ball then striking the black when trying to hit two reds instead of the pack off the cushion. A break of 69 took Gould, the world number 22, within a frame of victory and a missed routine pink into the centre pocket from Fu allowed him the opportunity to close out victory. Fu revealed he had been woken by a fire alarm in his hotel during the night but insisted it did not have a bearing on his performance. "Obviously I was distracted but I went back to sleep half an hour later. It wasn't that at all," he said. "Some of the pots I made were pretty good but overall I'm just too inconsistent. It's just frustrating for me at the moment." Gould said: "I'm quite happy with the way I played. I can still play a lot better but I'm just glad to be into the next round."